The Ambanis kicked off Isha Ambani's pre wedding festivities with a Dandiya Raas! Business magnate Mukesh Ambani and Nita Ambani’s daughter Isha Ambani is all set to tie the knot with long term boyfriend Anand Piramal at the former’s residence Antilia, Mumbai. The festivities kicked off last night with dandiya raas. 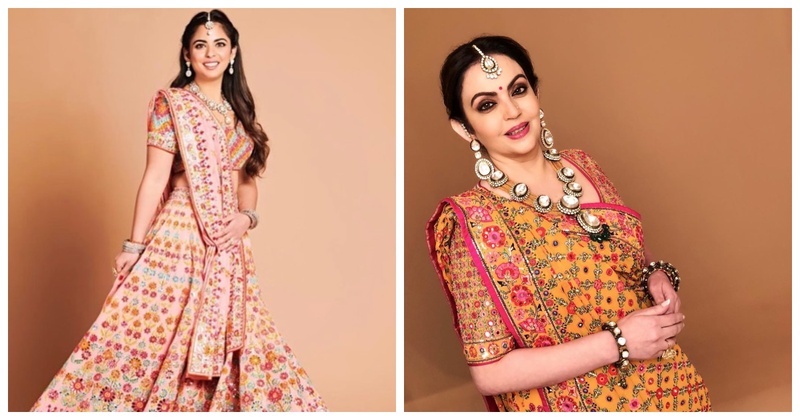 Mother of the bride, Nita Ambani was spotted in an Abu Jani Sandeep Khosla chanya choli and polki jewellery while the bride herself chose another Abu Jani Sandeep Khosla lehenga with intricate thread and mirror work! Love how her makeup is subtle and her jewellery matches well with her outfit! Nita Ambani’s smokey eyes with raspberry lips goes so well with her outfit and her personality! We can’t wait for the other pre wedding functions and their wedding itself!